To Lose Weight I Had to Change Some Habits! I knew that going low-carb was the answer for me. 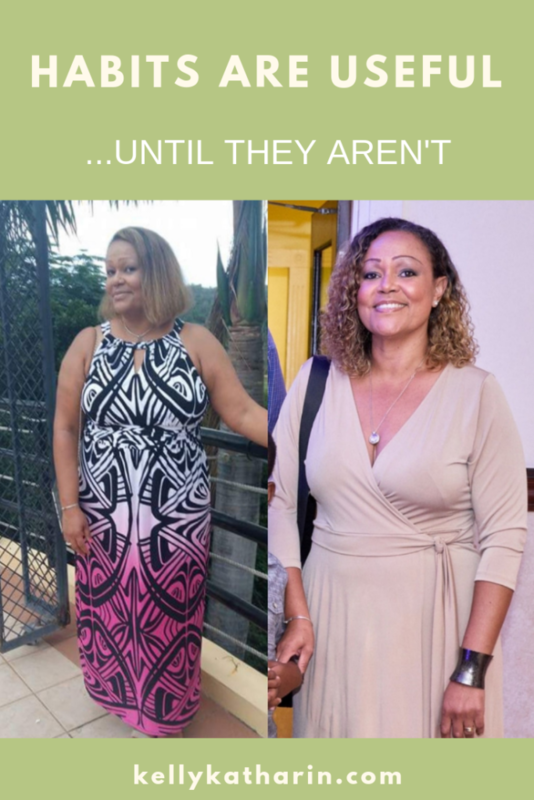 I had experienced success in the past doing this and so I decided to try the keto diet. 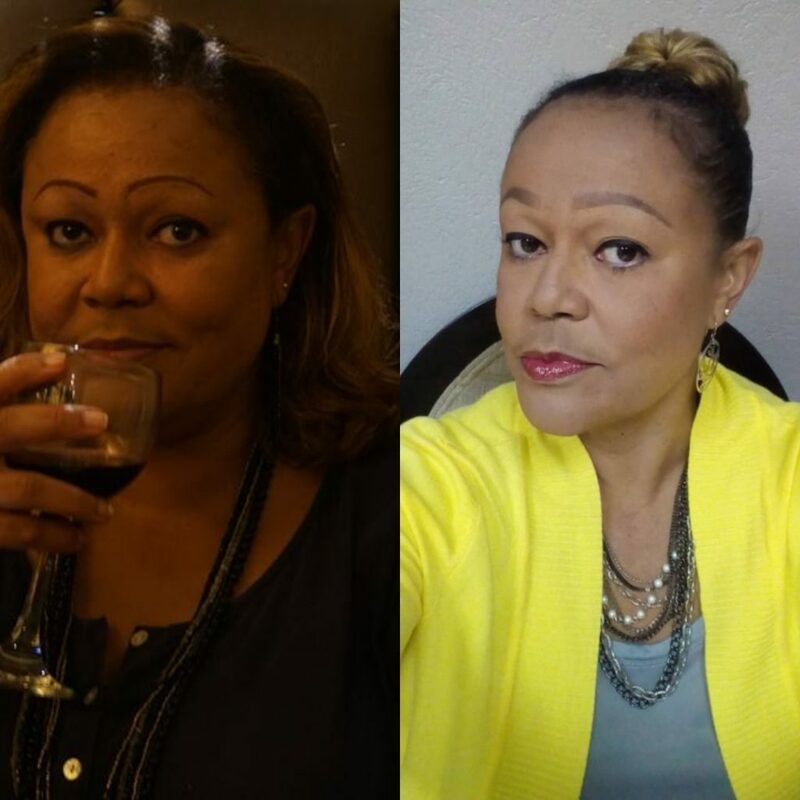 I made one major change up front: I removed carbohydrates from my diet. I stopped eating bread, rice, pasta, potatoes and sugar in particular. 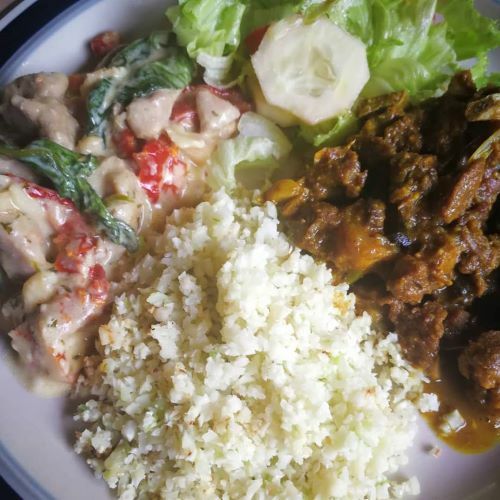 This is how I had eaten basically all my life, and eating curried goat, for example, with anything other than white rice, was unthinkable! Eating an omelette without toast for breakfast sounded like an entirely odd thing to do. All my snacks were high carb in nature: biscuits, chips, etc. Those too had to go. I started snacking on nuts and cheese instead. Once I decided that I was cutting carbs from my diet, I decided to replace the carbs. I didn’t just remove the carbs, I replaced them. I changed my habit of eating carbs with every meal. I replaced rice with cauliflower rice when I decided to cut carbs! Before keto, I basically ate from the point of waking up until going to bed at night. The only time I wasn’t eating was when I was sleeping. A few months into my keto journey, a friend introduced me to the concept of Intermittent Fasting as complementary to my new way of eating, and it has been a game changer. Intermittent fasting calls for eating only within a defined time frame during the day. So there are periods during the day when I simply don’t eat. I don’t eat between 6pm and 10am. I don’t eat anything. I changed my habit of eating all the time. I used to drink alcohol. A lot. Especially on weekends, beginning on Friday evening after work. Now there are alcohol options that are very much low-carb, in particular, my fave, RUM. BUT as I did my research, I discovered that drinking even these low-carb drinks, kicked me out of ketosis. In other words, once I had rum in my system, my body stopped burning its own fat stores, turning to deal with the alcohol instead. So I stopped drinking. I didn’t have a single drink for the first 6 months on my keto journey. Once I had lost weight, I reintroduced rum on select occasions, in specific quantities. I became intentional about my drinking. I changed my alcohol habit. I found ways to celebrate the end of the work week that didn’t include alcohol! Habit #4: I used to workout, but inconsistently. Some people, when my weight loss started becoming obvious, asked me if I had started working out. Fun fact: I have always worked out. I discovered long ago that I had to be doing some form of exercise in order to keep my sads away, to keep my mind and body aligned. Perhaps I wasn’t always consistent, perhaps the intensity could have done with some stoking up. But I have always exercised. 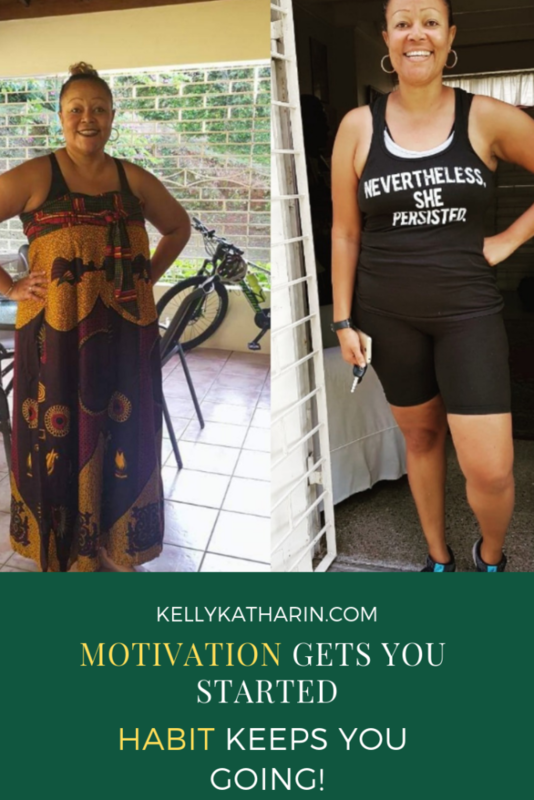 But as I changed my diet, and as I lost weight, I felt the urge to move more, to move with more intensity, and it literally became easier for me to do just this. And I developed an exercise habit that I’ve been consistent with now for over a year. I exercise 5 days a week, between 30-40 minutes per day, except the 5th day, where I go for an hour or more. I changed my exercise habit. I’ve always enjoyed drinking water. But my water game has seriously leveled up since going keto. I now drink at least a gallon of water per day. I knew that drinking water was key to succeeding on the keto diet, so I started to walk with my water bottle, drank room temperature water until I got used to it, and before I knew it, I was consuming 3 x 1.5L water every day. I changed my water habit. My friend Earl, in response to an open query I made for recommendations on books I could consult about habits, how to break old ones and form new ones, recommended a great book that I highly recommend: “The Power of Habit” by Charles Duhigg. Wow. It very clearly explained exactly how I was able to change the habits I listed above, using an easy to understand framework that demonstrates the anatomy of a habit. The beauty of a framework such as this is that it serves as a model that I now use to help others understand in the first instance their own unproductive habits and then come up with ways to change them. Habits are not necessarily bad things! Now habits are not in and of themselves bad things. Think of how many things we do almost unconsciously throughout each and every day. We brush our teeth for example, following a sequence of events that we don’t even have to think about. Habits, automatic behaviours, come about as our body’s way of not having to expend unnecessary effort. We no longer have to think about the how, why, where and when. We simply do by virtue of sheer habit. Once a habit emerges, the brain no longer has to participate in decision making. The Cue, Routine & Reward nature of habits. We first get a cue to do something. For example, it’s dinner time. That’s my cue to eat. Then we act on that cue, carrying out something called a routine. The dinner routine is that I ate meat, vegetables and rice. I had to have rice for the gravy, right? And we act on this cue because of the promise of a reward of some sort at the end. The reward for eating dinner was the enjoyment I felt sopping up all that gravy with my rice (or potatoes). A habit has a cue, and routine and a reward. And what drives this loop of the cue (or trigger), routine and reward is a craving for that reward. Duhigg proposes that in order to change a habit, the most effective way is to change the routine. So in my case of eating a dinner without carbs, I had the same cue (dinner time) and I craved the same reward (enjoying my gravy). I changed the routine! I replaced rice with cauliflower. Riced cauliflower proved to be an acceptable vehicle for the gravy I craved. I thought about my Friday evening drinking habit too. I felt that I deserved to relax and be rewarded for coming to the end of a tedious, unenjoyable work week. The cue remained (it was Friday evening), the reward remained (a feeling of celebration) but the routine changed. I decided that I would eat something really delicious but low-carb on Friday evenings instead. So I’d treat myself to shrimp or steak or juicy pork chops with an ice cold diet ginger ale in my favourite rum tumbler. The craving for the reward remained, I wanted to mark the end of the week in a celebratory manner. I just changed how I did it. Duhigg also speaks about the magic of the “keystone” habit. A keystone habit is that habit, which when changed, results in several other habits being changed or new habits being formed. In my case, my keystone habit was replacing carbs with green veggies. That single change caused me to develop my exercise habit. As I felt more energetic and became lighter, it felt only natural for me to move more. It didn’t require a huge effort on my part to start exercising more frequently, consistently and with more intensity. Even before I knew this term, I spoke about “The Flywheel Effect”, where one good decision inevitably leads to other good decisions. Ever notice that the mornings where you work out see you making better food choices throughout the day? Now let’s go back to willpower. I’ve stated that my success to date on the keto diet is not due to willpower. I’ve always felt powerless in the face of my cravings and large appetite. I’ve lost weight using meal replacements, cutting calories and increasing my exercise. But none of these approaches has been sustainable. They’ve been painful and boring for the most part. As I’ve cut carbs from my diet, however, something happened. I keep telling people its science, not magic! In the absence of carbs, my body stopped secreting so much insulin. 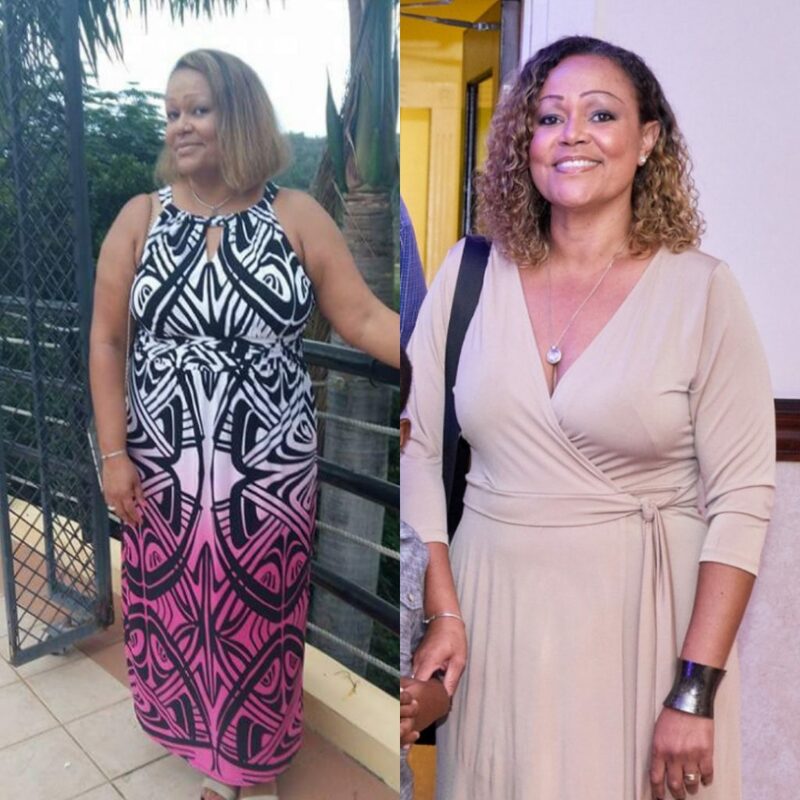 With my new lower insulin and blood sugar levels, cravings disappeared, I felt full quicker and longer and my body burnt its own fat for energy. The result was weight loss without pain or effort. No doubt, the initial weeks of changing my routines which involved cutting carbs from my diet, required some level of determination. I don’t refer to it as willpower, some of you might. I simply believe that I had made a decision, and then created a plan to support my decision. But there was something very important in those early weeks that helped me stick to my new routines which were not yet second nature. Remember that we form habits as a way to conserve energy. It’s one of the wonderful ways that we’ve survived as a species for eons. New routines require new neurological pathways in our brains to be formed. So there is in fact some effort required to change our routines, and therefore to essentially change our habits. One of the critical things in creating these new pathways which will eventually form the basis of our new habits, according to Duhigg, is belief. Alcoholics Anonymous stresses the importance of faith in the road to sobriety. You certainly don’t have to believe in God in order to lose weight and change your habit (although as a person of faith myself I believe that it does in fact help) but you have to believe that your new actions will lead to the reward you crave. I really wanted to lose weight. I believed that eating low-carb would cause me to lose weight. So I persisted with the effort that it took to override my old pathways by creating new routines. I believed because I saw it work for others. 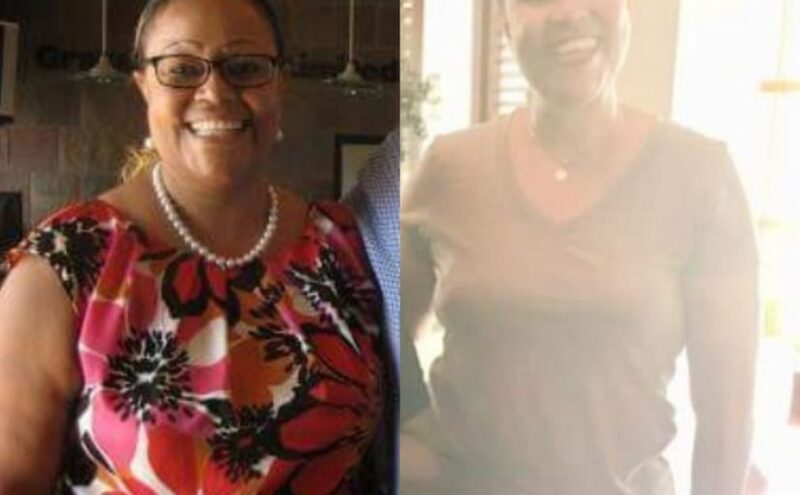 I joined online support groups where I saw women in their 50s lose weight by cutting carbs. I saw women like me, slow losers, persist and win. I believed that I too could do it. And so I stuck with it. There is strength in community. 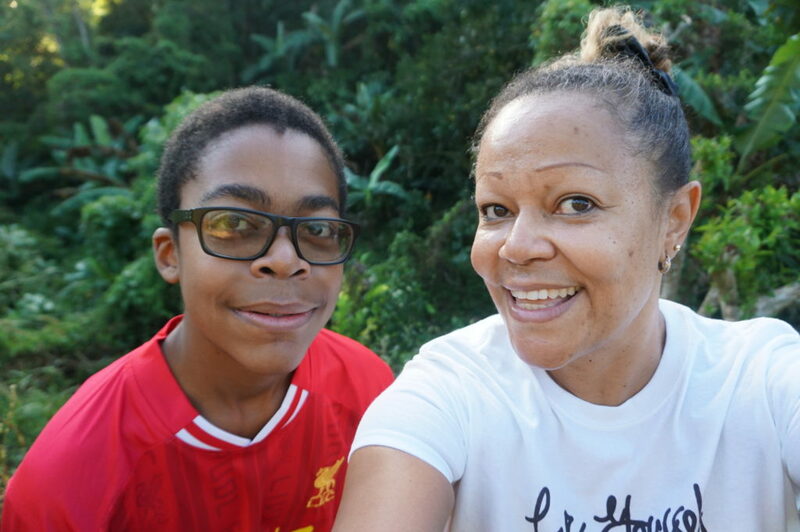 My then 14yo son was on the keto journey with me too. It became easier for me to rid my house of bread and rice and sugar because the 3 of us at home at the time had decided to give up carbs (well my hubby not so much at the time, but he was willing to get his own bread when he felt for it and he was willing to eat our low-carb meals). Our little low-carb community in our home survived because we removed temptation and we held each other accountable. This sense of community in the home made it easier to change our routines and therefore change our habits. AP & Me. We started this keto journey together. And we’re still going many pounds and months later! Today, a year and a half later, our new habits are automatic. New pathways in our brains have been formed and we simply don’t have to muster up effort to enjoy a meal of oxtail and cauliflower mash! We’ve formed new neurological pathways that determine how we behave without the expenditure of too much effort. On Sundays we used to enjoy cake and ice cream after dinner. 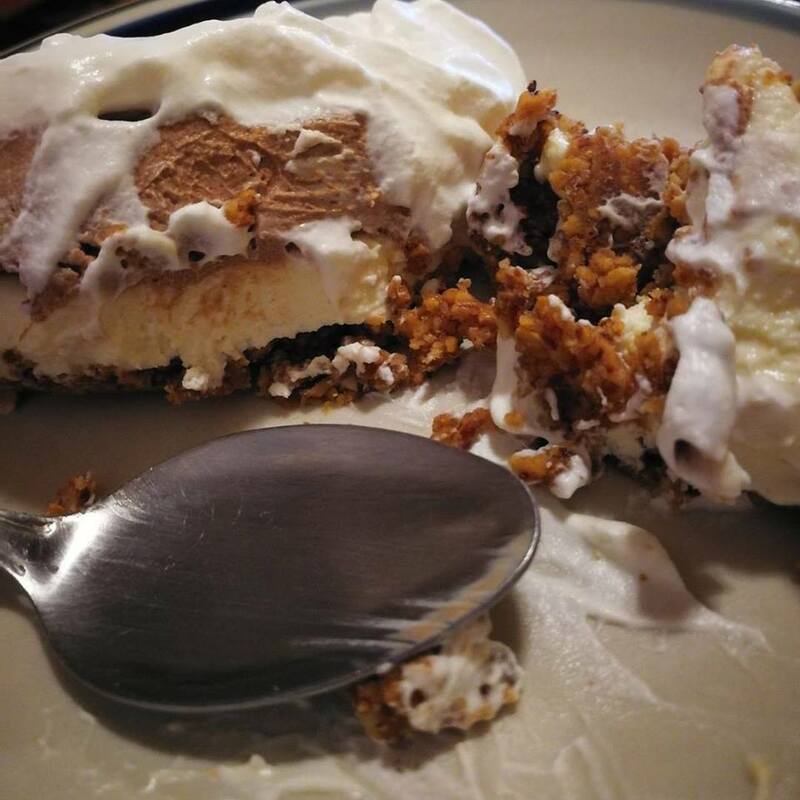 The cue remained (Sunday evening) the craving remained (a sweet treat as some sort of reward that we deserved every Sunday evening) but the routine of cake and ice cream changed to low-carb cake and ice cream! If you’re interested, here are a few of my favourite low-carb desserts. Replacing desserts with low-carb variations has made it easier to give up sugar! Once you understand this, you can then change the routine until this new routine, this new habit, creates new pathways in your brain such that you don’t need to make a huge effort to do this new thing. According to James Clear, it takes on average 66 days to form a new habit, sometimes longer depending on the habit, the context and whether or not there is actual addiction involved. You will need to repeat this new routine over and over again for the new habit to replace the old one. Support in the early days of changing your routine really helps you to repeat this new routine until it becomes entrenched. There will be days when it seems so easy. But on a bad day, or when your energy is low, or when you’ve made one bad decision, the effort you have to make to carry out this new routine will seem an impossible task. This is where belief and support are critical. Get an accountability partner or join a support group. Look at others who’ve done exactly what you’re trying to do and believe, know that you can do it too. It’s so difficult to make many changes all at once. 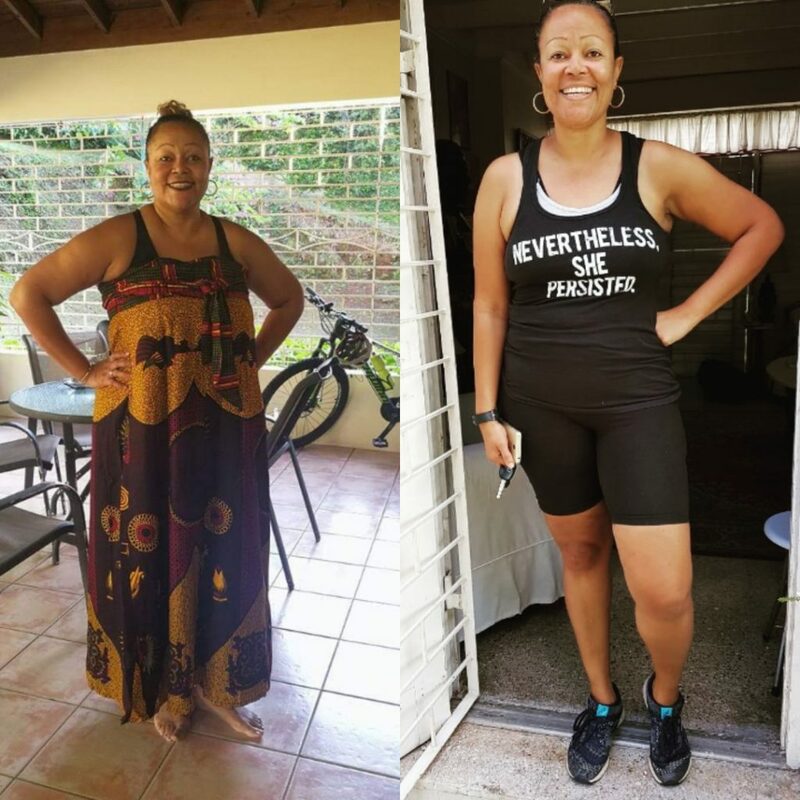 Even before I understood the concept of a keystone habit, I instinctively knew that I would be setting myself up for failure by trying to change how I ate, introduce fasting and increase my exercise all at once. I knew that changing my diet would be the best way for me to lose weight and so I gave that change all my effort in the first instance. Once I changed that keystone habit, eating carbs, other changes became easy. Remember to try to identify that one habit which when you change it, results in you changing other habits with less effort. This is your keystone habit. 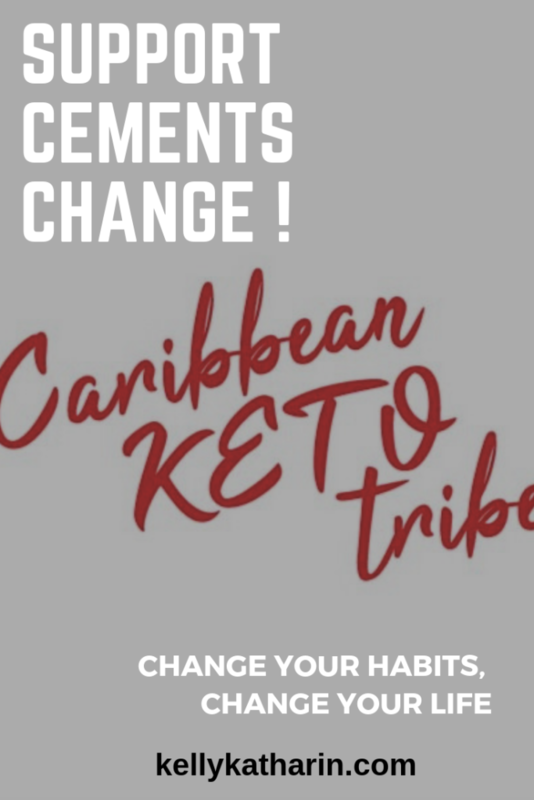 Join our Caribbean Keto Tribe on Facebook where you’ll meet people succeeding on keto while enjoying yummy Caribbean food! Click on the link. It’s as easy as that. I also offer personalised guidance in terms of meal plans and coaching for those who feel that this could be of benefit. Please feel free to contact me here for further information. Sure, changing habits is not easy. But it can be done. Hopefully you now understand a little better the importance of habit and how you can take specific, intelligent actions to change the ones that no longer serve you well. What one habit will you change in your pursuit for a better quality of life? Another very informative article Kelly. The habit that I intend to change from Monday March 18 is to wake up earlier. Currently, I wake up between 8:30 and 10 a.m., depending on what time I am go to bed. The reward will be getting to see the early sun and have coffee on my little patio in cooler temperatures. I am going to start gradually, e.g. try waking up 7:30 first day, then 7, then 6:30 then 6. Which means stop going to bed between 12:30 and 2 a.m.!!!! Is your desired reward of seeing the sun and having coffee on your patio a strong enough incentive for you to work against your natural body clock? If you decide that it is, then I agree with your stated approach to alter the cue from the night before and develop a new routine. In this instance, your cue is to set out your coffee paraphernalia from the night before (include a nice mug) and your routine is going to be one that you follow every night to get you to go to bed earlier. It could be warm shower at x time, cup of tea at x time, lights out at x time. There are loads of bed time rituals out there for people who can’t fall asleep easily at an appointed time. Good luck! Next Next post: “My New Normal: Reflections of a Stroke Survivor” A book review.